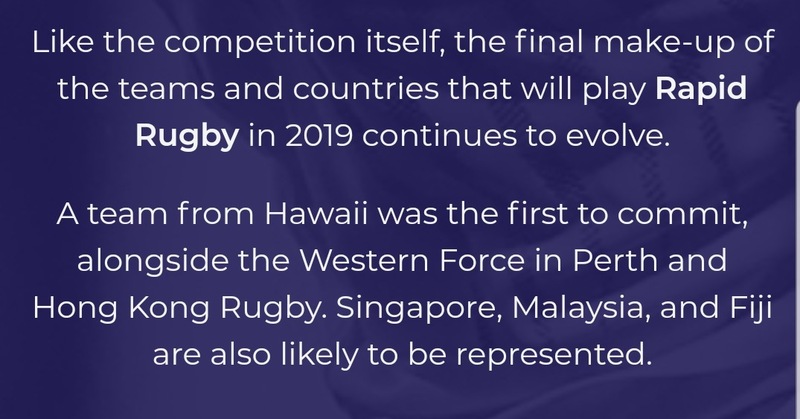 Indo-Pac Rugby would've been my go. The IPR. Though they could have gone with Asian Premier League. That would be a giggle. Last edited by chibi; 06-11-18 at 20:30. That's 6 teams so far. Making it potentially a 15 team comp which seems about perfect for a round Robin competition. 15 weeks with 3 week final series. Alan Jones said in his article that Twiggy hasn’t ruled out western Sydney. Western Sydney were all over the concept, having been left out in the cold yet again bu ra et Al. In the end, NSWRU couldn't handle the competition so put a lid on it. Western Sydney rugby supporters just took the easy route to reviving rugby by remaining with the monopoly, it's quite different to not wanting it. The next thing I want to hear about is what is happening with the new ‘Own the Force’ initiative. Talk about a freakshow......listen and weep. Hugh "I dunno" Cavill (but doesn't stop him giving his opinion on absolutely everything), Jamie & Nick Wasiliev waxing lyrical about Global Rapid Rugby and showing their total lack of imagination, lack of appreciation of what Minderoo is doing to keep rugby alive in the West and to grow the game in the region and total lack of any realisation that the current rugby model in Australia is broken. Could G&GR actually be more irrelevant to the game that's played in heaven? Last edited by andrewg; 07-11-18 at 10:23. If you look at the situation from the perspective of an east coast Rugby supporter you can understand how some of those comments are arrived at. I mean, it's not as though a lot of us over here aren't scratching heads in confusion with not many months left until the new comp is supposedly kicking off. Hong Kong I'm happy with. Singapore - pretty doubtful. If at least one team from Japan is not in the mix for 2019, I'll be pretty disappointed, after what we saw from Panasonic. I thought those blokes in the podcast were quite appreciative of the support from Andrew Forrest, although they are misreading his motivation. Also they were disparaging of the way Rat's Arse have totally misread the WA situation (and from there I suppose, logically, the Victorian situation). Their conclusion was that one way or another WA has to be brought back into the mainstream of Australian Rugby. I can't argue with that, once the current arse clown circus has been removed. My preference is its confirmed fully and completely by World Rugby and cant be blocked or taken away by RA and "OTF" after that. I don’t care what they call it as long as we get good and competitive rugby and until we know that I don’t think the “Own the Force” has any value. So the sooner we know who’s playing the better but yet again I suppose the FURA are putting roadblocks in the way and slowing everything up as much as possible. Shasta you keep on talking like that you will be accused of all sorts of nonsense. I suppose that we should feel slightly sorry for the ruling coterie of the ARU/RA and their partners in crime at the NSWRU. They are caught between a rock and a hard place. On the one hand, they do not want any of Andrew Forrest's initiatives to succeed. But on the other hand, they don't want to piss him off so completely that he storms off in a huff and takes his money with him. The ARU/RA's dream position is that Mr Forrest would leave $50M to $100M on a table at Moore Park, and disappear quietly back to Perth to build another iron ore mine, never to darken the ARU/RA's door again (or at least not until the ARU/RA has burnt through the money which was left on that table). The problem for the ARU/RA is that as long as Mr Forrest and his cheque book remain in the mix, the ARU/RA has a chance of getting its hands on some of his money. If he gets sick of all the nonsense being peddled by the ARU/RA and gives up on the whole shooting match, then the ARU/RA will have no chance of getting their hands on the money which they so desperately need. Last edited by FingerTips; 08-11-18 at 11:37. I think hell will freeze over before RA get a cent of Twiggy’s money now. The ARU/RA's financial position is precarious, even with the windfall revenue from the sold out test in Perth next year factored in. When the depth of the financial black hole in Melbourne became apparent, questions were asked as to why the ARU/RA had turned its back on Andrew Forrest's original offering. Apparently, a comment was made that it wouldn't be a problem, because Melbourne has a lot more billionaires than Perth. But have any of those billionaires made a commitment to rugby like Andrew Forrest has?